Valentine's Day was first celebrated on Feb 14 around AD 270, Lupercalia festival, the spring festival of fertility in Rome. In present times Valentine’s Day is celebrated each year on the 14th of February. This is done by giving cards and gifts to your significant other. However, the holiday wasn’t always celebrated in this way. This holiday began as just a day when birds began to pair off. This is one reason why this holiday is celebrated on this particular day. This all started with the story of the patron Saint Valentine. In Rome (in around 269 AD), the Emperor Claudius II was having trouble getting men to join his army. He felt that his problem was because men were getting married. Once they were married, they would not join the army because they didn’t want to leave their significant other. Therefore, Claudius II banned marriages and engagements in the city of Rome. He believed that by doing this, he would be able to get more men to join his army. This is when Saint Valentine comes in. He was secretly performing marriages against the law of Claudius II. Once Claudius II found out what he was doing, he commanded that Saint Valentine be beaten with clubs and beheaded. Valentine spent his last days in prison.There Valentine healed the jailer’s daughter "Asterius" and fell in love with her. Before his execution he wrote her a letter signed "Your Valentine" as a farewell. Saint Valentine was executed on the date of February 14th. 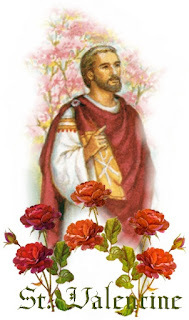 Saint Valentine became known as a saint after his death. He also became the patron saint of lovers. People started celebrating Valentine’s Day by giving cards and simple gifts such as flowers to each other. The cards were homemade and became known as valentines. As time went on, companies made cards for people to give to their loved ones. Nowadays, there are a number of different gifts and cards available at the store for you to purchase for your loved one. You can give flowers, candy, cards, and teddy bears for this holiday. Children are even able to give cards to each other in their school classroom.